State government of uttar pradesh very soon going to publish official recruitment notification for the post of 2498 Anudeshak instructor posts. Official advertisement / notification will be published in the month of October 2014. All recruitment process will be completed till march 2015. This information is given by chief secretary in the training of ITI teachers. State government of continuingly working in the improvement to technical education that’s why government wants to till 1600 Anudeshak posts. 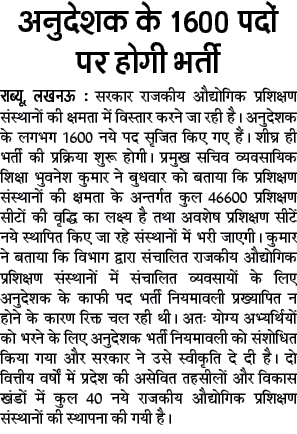 this information is given by the chief secretary of Vyavsayik siksha v Kaushal Vikas vibhag uttar pradesh. He was participating two days training camp which was held fro ITI teacher by TCS and CII. He told that official vigyapan for the instructor posts likely to be published in the moth of October. After that department will complete the all recruitment process before the he march 2015. Application form will be invited online. so all recruitment process will be completed online. Department currently developing a software for inviting online application form. Department also want to fill other vacancies of other categories. Most probably its expected that government take decision till the December. as we know government increased the ITI seats approximately 46600 in last two years. Government also focusing in modernization of ITI institute. He told that mostly ITI following old syllabus and technology which is not capable to provide a good job to trainee of ITI. Region head of TCS said that a work force of UP is skilled and defiantly it will be game changer for development of up. As we get now news update regarding ITI instructor posts we will immediately inform you here.